Produced For – Funklord Productions, Inc.
Phonographic Copyright (p) – Def Jam Records, Inc. Copyright (c) – Def Jam Records, Inc. Copyright (c) – Going Out Productions, Inc. Copyright (c) – Home Box Office, Inc. Published By – Becket Music Publishing Co., Inc. Published By – Joshua Music, Co. Published By – Birdees Music Corp.
PC 1998 Def Jam Records, Inc.
℗ © 1998 Def Jam Records, Inc. Manufactured and Marketed by Def Jam Records, Inc.
Track A1, A2: Recorded & Mixed at Battery Studios, NYC. Track A3: Produced for Skyforce Productions - overseen by Rittenhouse 537. Recorded at Quad Studios, NYC & Hit Factory, NYC. Mixed at Battery Studios, NYC. Contains a sample from "Bright Tomorrow" performed by Mighty Clouds Of Joy. Used courtesy of Universal Music Group. Left Eye appears courtesy of LaFace Records. Track A4: Recorded at Larrabee West, Los Angeles, CA. Mixed at Battery Studios, NYC. Streetlife appears courtesy of Method Man Entertainment. Track A5: contains audio excerpts of The Bishop "Magic" Don Juan, (c) 1998 Going Out Productions, Inc.
Track A6: Recorded at Mirror Image, NYC. Mixed at the Hit Factory, NYC. Streetlife appears courtesy of Method Man Entertainment. Cappadonna appears courtesy of Razor Sharp/Epic Records. Track B1: Recorded at Ameraycan Studios, Los Angeles, CA. Mixed at Battery Studios, NYC. Track B2: Recorded & Mixed at Battery Studios, NYC. Track B4: Recorded & Mixed at Battery Studios, NYC. Streetlife appears courtesy of Method Man Entertainment. Track B5: Recorded & Mixed at Battery Studios, NYC. Contains an interpolation of "I'll Do Anything For You" (R. Miller, C. Reid) Becket Music Publishing Co., Inc./Full Feel Music (ASCAP). Contains an interpolation of "Last Night A DJ Saved My Life" (M. Cleveland) Windswept Pacific Songs (BMI). Contains a sample from "Warp Factor II" (V. Montana, Jr.) Vicent Montana, Jr. Music (ASCAP), performed by Montana. Used courtesy of Anatom Music Corp.
Track B7: Recorded at Soundtrack Studios, NYC. Mixed at Mirror Image Studios, NYC. Streetlife appears courtesy of Method Man Entertainment. Raekwon appears courtesy of Loud Records. Masta Killa appears courtesy of Loud Records. Killer Sin appears courtesy of Wu-Tang Records. Inspectah Deck appears courtesy of Loud Records. Track C1: Recorded & Mixed at Soundtrack Studios, NYC. Track C2: Recorded at Battery Studios, NYC. Mixed at Battery Studios, NYC. Track C3: Recorded at Larrabee West, Los Angeles, CA & Quad Studios, NYC. Mixed at Battery Studios, NYC. Contains audio excerpts of The Bishop "Magic" Don Juan from the HBO Documentary by Brent Owens "Pimps Up, Ho's Down." 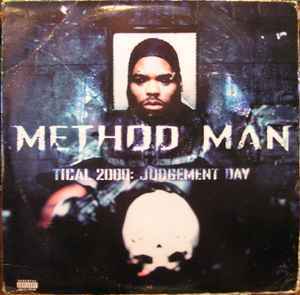 (c) 1998 Home Box Office, A Division Of Time Warner Entertainment Company, L.P. Also contains additional audio excerpts, (c) 1998 Going Out Productions, Inc. Streetlife appears courtesy of Method Man Entertainment. Track C4: Produced for Funklord Productions, Inc. Recorded by Soundtrack Studios, NYC. Mixed at Mirror Image, Dix Hills, NYC. Contains a sample from "I Get Around" (R. Brooks, G. Jacobs, S. Murdock, L. Troutman, R. Troutman, T. Shakur) Styleetron Music (ASCAP)/GLG Two Music/Pubhowyoulike Publishing c/o Zomba Songs/Joshua Music Company c/o Music Corp. of America/Saja Music Company c/o Songs of Lastrada (BMI), performed by Tupac. Used courtesy of Zomba Recording Corp.
Track C5: Recorded at Soundtrack Studios, NYC. Mixed at Battery Studios, NYC. Streetlife appears courtesy of Method Man Entertainment. Havoc & Prodigy appear courtesy of Loud Records. Inspectah Deck appears courtesy of Loud Records. Track D1: Recorded at Quad Studios, NYC & Battery Studios, NYC. Mixed at Battery Studios, NYC. Streetlife appears courtesy of Method Man Entertainment. Track D2: Recorded & Mixed at Battery Studios, NYC. Contains a sample from "Everybody Gotta Believe In Somebody" (D. Porter, I. Hayes) Birdees Music Corp., administered by Rondor Music and Walden Music, Inc., administered by Warner/Chappell Music (ASCAP), performed by Dee Dee Warwick. Used courtesy of Atco Records by arrangement with Warner Special Products. Star appears courtesy of Sector 2000. Polite appears courtesy of American Cream Team Productions. Track D3: Recorded at Ameraycan Studios, Los Angeles, CA. Mixed at Battery Studios, NYC. Track D4: Produced for Funklord Productions. Recorded at Encore Studios, Los Angeles, CA. Mixed at Mirror Image, Dix Hills, NYC. Contains a sample from "Tell 'Em" (E. Sermon) Erick Sermon Enterprises, Inc. administered by Zomba Music Publishing (ASCAP). Used courtesy of Def Jam Records. Under license from PolyMedia, a Division of PolyGram Group Distribution, Inc. Redman appears courtesy of Def Jam. Track D5: titled as "Make Ups 2 Break Ups" on shrink wrap sticker. Produced for Track Masters Production. Recorded at Hit Factory, NYC and Sony Studios, NYC. Mixed at Village Recorders, West Los Angeles, CA. Track D6: Janet Jackson appears courtesy of Virgin Records America, Inc.
Track D7: Recorded at Soundtrack Studios, NYC and at Battery Studios, NYC. Mixed at Battery Studios, NYC. Lyor Cohen & Russell Simmons.